I really didn’t think much of solar powered LED lights as a security viable product, my reason is that for outdoor use these night lights just aren’t going to be bright enough. Well I was wrong. 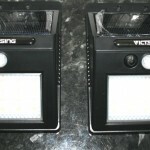 I have for review two (they come as a pair) outdoor solar charged LED security lights and they are superb to say the least – they also have a motion sensor which causes the lights to shine brighter when they detect movement. Here they are in detail. 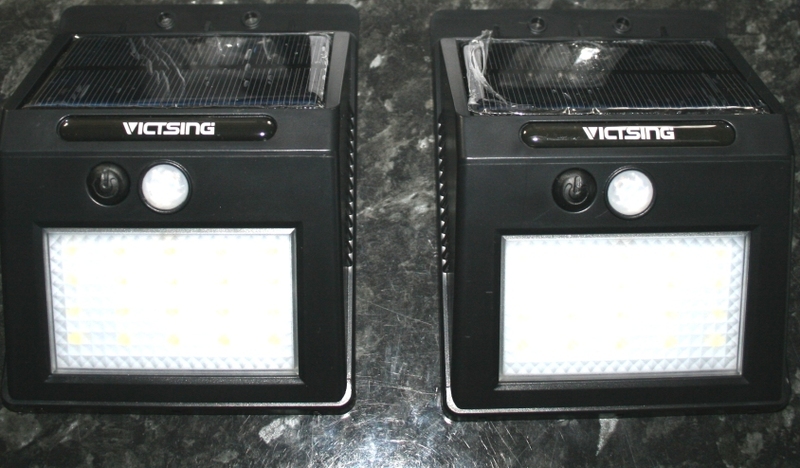 It is really quite difficult to portray lighting effects in a photograph as you will appreciate, but the picture above showing a close up shot of the solar powered LED security lights side by side shows that these things aren’t dim. I already own a single one of these lights, these are black but I have a white cased one. These are going to be placed on the side of my garage to light up my back garden. They really aren’t required to be truthful, just one of these outdoor lamps is enough to create sufficient light for my purposes, but I am so impressed with the “lack of maintenance” required, ease of installation (no mains power cable to route and fuse etc.) and clean looking compact design that I simply want “more!”. With regards to the security aspect of night lights, sometimes I wonder whether they actually help a potential burglar to see what they are doing rather than fumbling around in the dark, but when I think it through any would-be thief is more than likely going to be startled by lights as bright as these and would probably hide thinking they were being overlooked by a neighbour or something. 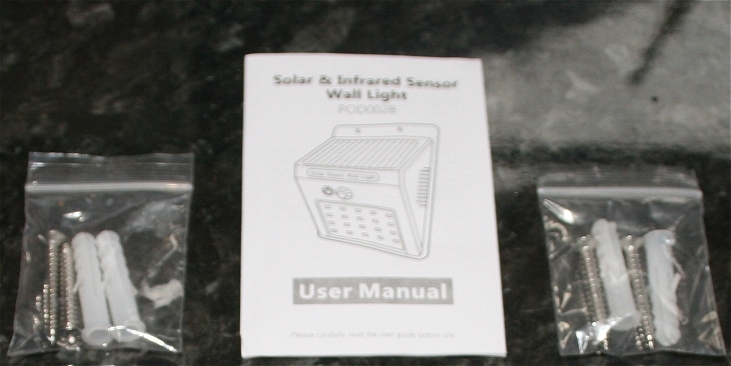 How to Install the Solar Powered LED Security Night lights. Installing the lights onto a wall is very easy given that there are no power cables to run. All that is required to fix these up is a drill and a screwdriver. Measure up the holes having decided where exactly they are going to be positioned. You can do this by placing the light onto the wall and using a pencil, poke it through the screw holes and mark out where you will be needing to drill. A masonary bit may be required depending on where you are mounting the lights. Take note that to get the best solar charge for your internal Lithium Ion Batteries, you will need to angle the solar array towards the sun when it is at its highest point in the sky at 12am. Don’t worry too much about this, as the batteries will charge over time – but will take longer the less direct sunlight they recieve. The actual components for installing the night security lights are shown in the photo below – and these items are provided with the outdoor lights kit. Also note that the motion sensor has a range of around 10 metres, so make sure that you will be able to activate them by walking past them or waving your hand at them. No point in installing security lights if the motion sensors are not tripped because they are badly situated and cannot detect infra-red movement. 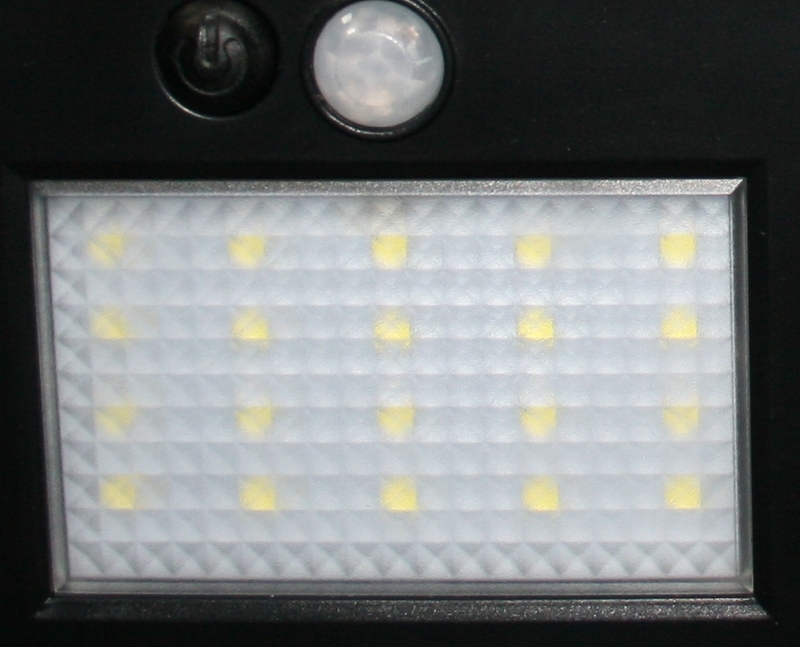 Close up of the LED Bulbs in the Night Security Light. 7) Variable quality and longevity. 8) Ceramic cracking with heat. These are just some of the issues I encountered over the years with the glass bulbs. In my opinion, given that the LED type suffer none of the above problems, they are far superior and represent a leap forward in terms of technology and user friendly operation and fitting. You can also see the power button (easy access) and the PIR sensor in the picture below. The outer case of the lights is made from tough plastic which does not rust. I also want to mention during this review that the actual size of the lights is rather small. 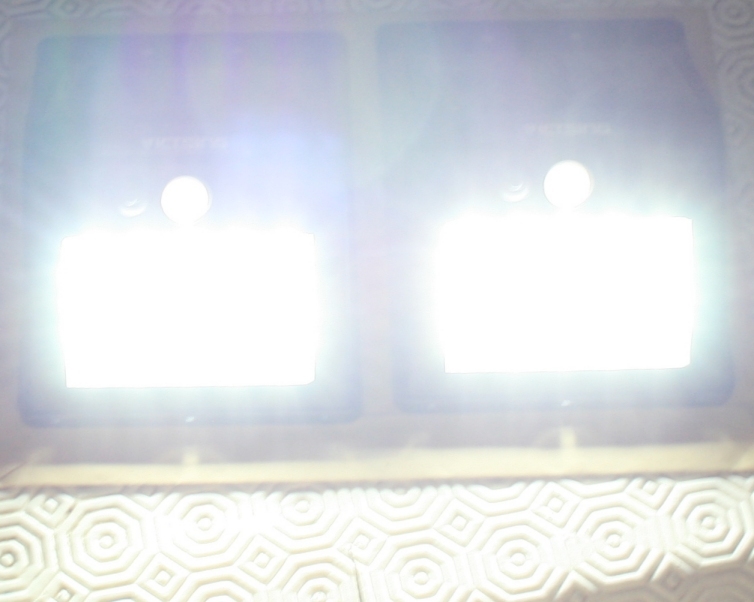 Whilst the brightness is excellent, they are less obtrusive than the metal bracket 240v type and are therefore more amenable to installation in a wider variety of locations around your home or office. In summary I think LED solar powered secure lighting is great for your electric bill, great for peace of mind during the dark hours of the night, fantastic value for money and these are one of the best products I have encountered in years. Another added bonus is that they are actually lit up permanently during the hours of darkness, but not on full power. Once the ambient light outdoors has reached a certain level of darkness, they automatically switch on with a very soft glow – almost like a warning to say “I am here” but not actually lighting up the garden. A nice touch!